I need to update my bedroom. It’s actually driving me nuts currently. While I love my DIY headboard, I can no longer stand using a bed skirt. Our bed faces double doors into the yard, and with the dog and Scarlet running in and out, and the chickens and garden outside, so much dirt seems to track in and collect on the bedskirt. Changing a king bed’s skirt to wash it is not fun. I can’t deal. I want a frame that goes all the way around the bed. I like a modern bed that’s a little funky. It must be comfortable, meaning it must not offer any sharp edges I will surely bang my shins on. 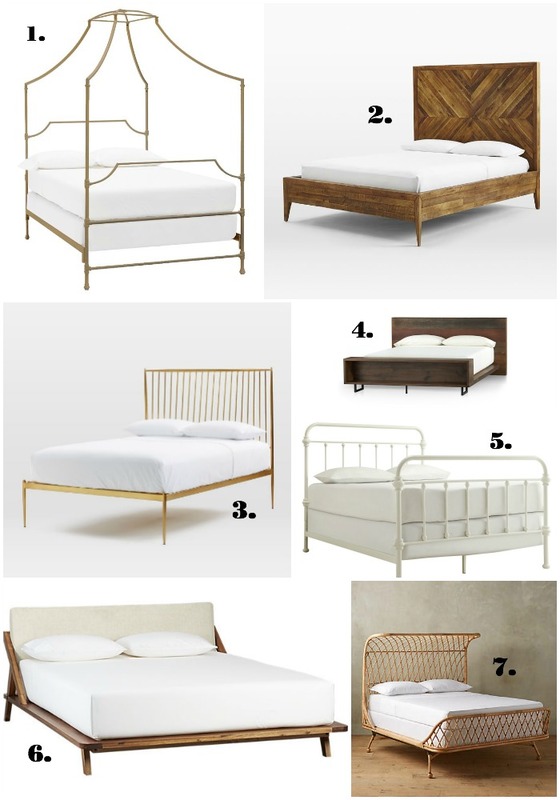 These are some of the beds on my short list. I’ve been trying to look for a new bed and keep going around and around. I had an expensive wooden one but the side rails were ruined by the mattress hitting the sides and were chipped…now I’m very reluctant to get a wood bed! Number 3 has good height and would be easy to clean under, but I’m really loving number 5! !